4365 ✉ 22Xc 1 Kr. 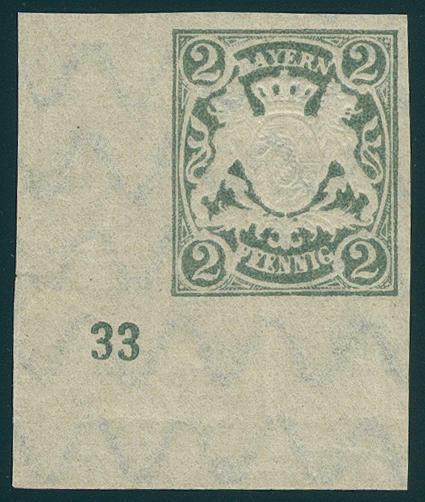 Bluish green, having bright colors and excellent perforated outstanding quality as a single franking on correctly franked local letter with single circle postmark \"Munich 13. January (1871) \", expertized Brettl BPP. 4366 ✉ 23X,25Xa 1 Kr. Bluish green, two examples, 3 Kr. Rose and 7 Kr. Dull ultramarin, all values wonderful fresh colors and well perforated, only 7 Kr. 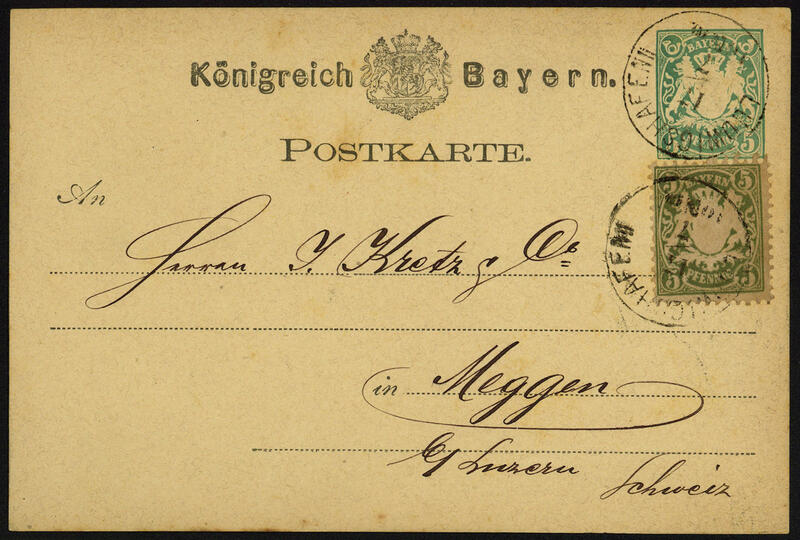 A missing tip at the bottom on decorative cover with clearly single circle postmark \"FUERTH 13. OCT. 71. 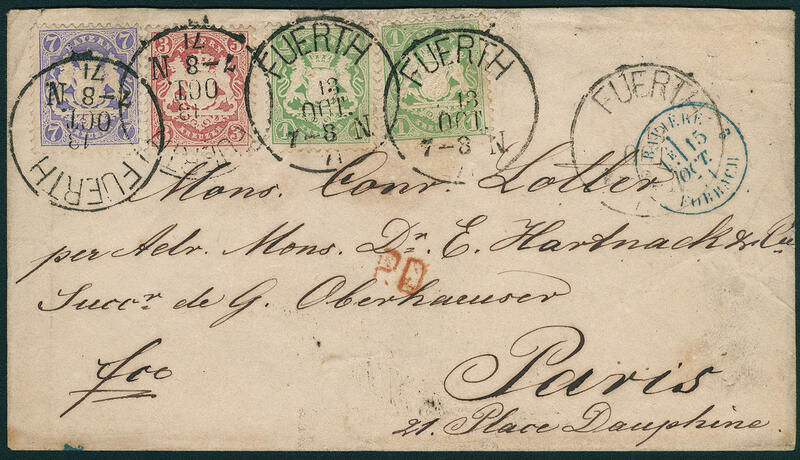 \" with border transit postmark from Forbach to Paris. A particularly beautiful three colors international franking, with in total 12 Kreuzer correctly franked franked. Photo expertize Brettl BPP. 4367 ∆ 24Y 6 Kr. 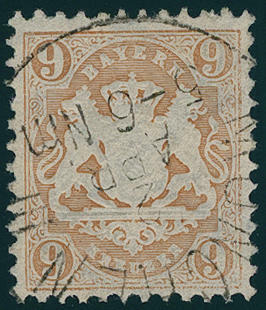 Bright ochre-brown, watermark wide lozenge, beautiful on piece in outstanding quality with perfect adornment single circle postmark \"LANDAU 14 / 5\". 4368 ⊙ 26X 12 Kr. 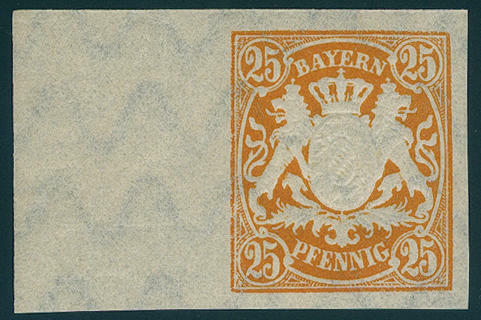 Lilac watermarked \"close lozenges\", fresh colors and in perfect condition perforated with centered blue violet single circle postmark \"Munich 15. MAR. \". An outstanding quality this sought-after issue! Photo expertize \"perfect quality\" Sem BPP. 4369 ⊙ 26X 12 Kr. 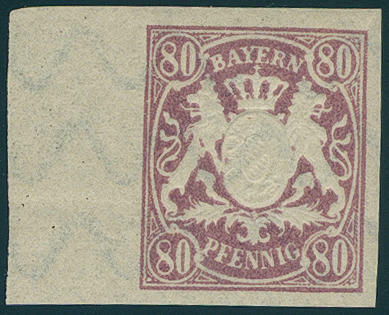 Dark brow purple, watermark close lozenges, having bright colors and excellent perforated extremely fine copy with violet single circle postmark \"Munich\", expertized Brettl BPP. Michel 1400,- €. 4370 ⊙ 26Y 12 Kr. 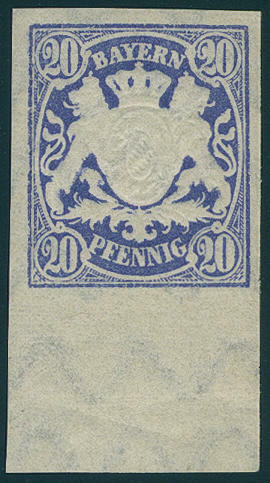 Violet with scarce watermark \"wide lozenge\", wonderful fresh colors and very well perforated, neat cancelled with violet blue single circle postmark \"Munich\". A very impressive copy this nearly always missing issue in perfect quality. Photo expertize \"faultless condition\" Brettl BPP. 4371 ⊙ 27Yb 18 Kr. Vermilion, wide lozenge, centric neat cancelled outstanding quality, expertized Brettl BPP. 4372 ⊙ 28X 9 Kr. 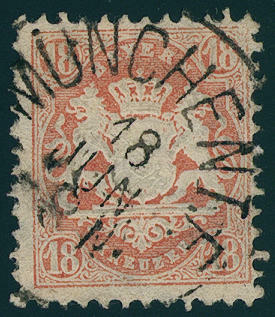 Pale red brown, watermark close lozenges, fresh colors and very well perforated with centered clear single circle postmark \"Munich 2. April \". An especially nice copy of this rare issue! Photo expertize \"entirely faultless condition\" Schmitt BPP. 4373 ∆ 29Ya 10 Kr. 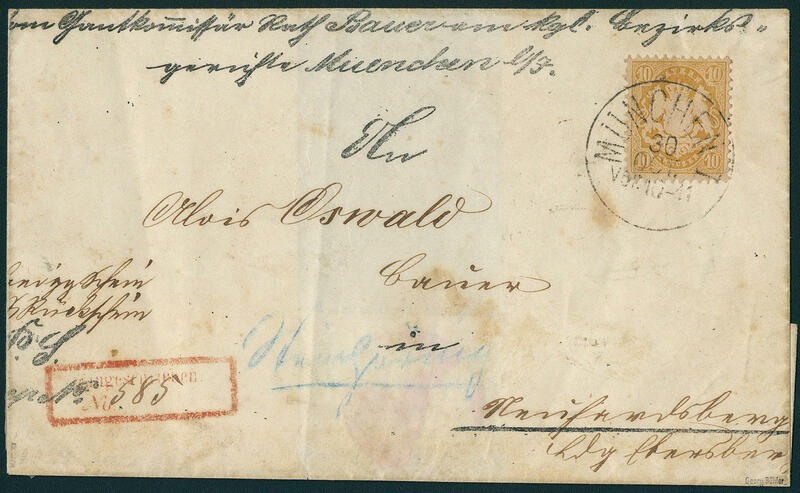 Dull yellow, as block of eight fixed, fresh colors and very well perforated, not all pieces se-tenant, on piece with single circle postmark \"SCHWARZENFELD\", very high franking and in this kind extraordinarily rare! Expertized Buehler, Pfenniger. 4374 ∆ 34 7 Kr. Dark ultramarine, watermark far waved lines, having bright colors outstanding quality on very nice letter piece with clean mounted single circle postmark \"K. B. 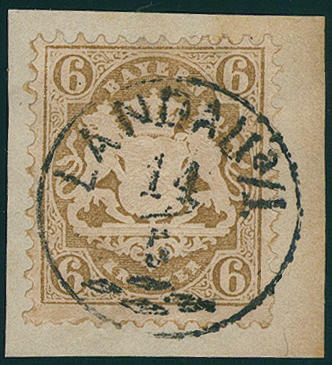 Railway mail 15. December\", expertized Brettl BPP. 4375 ✉ 35 10 Kr. 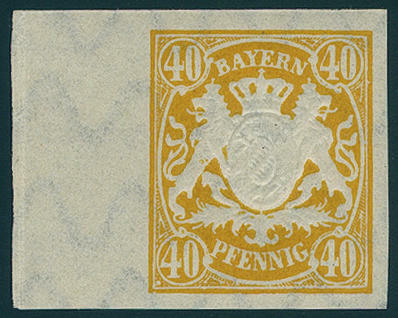 Yellow, watermark far waved lines, having bright colors and excellent perforated outstanding quality on registered cover with clear single circle postmark \"Munich 30. 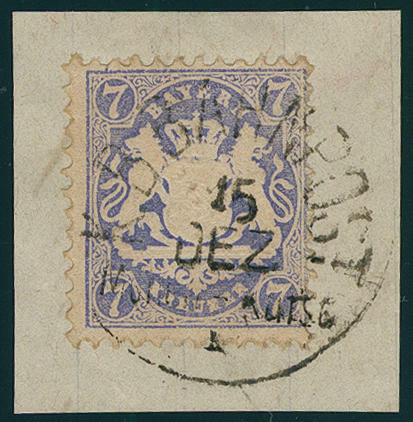 OCT. (1875) \" with additional red rectangular cancel \"registered\" and blue pencil routing indicator \"STEINHÖRING\" to Neuhardsberg with on the back transit cancellation \"KIRCHSEEOH\" with arrival postmark \"EBERSBERG\". A very scarce, nearly always missing franking! Photo expertize \"faultless condition\" Schmitt BPP. 4376 ✉ 38c 5 Pfg. Gray olive green, outstanding perforated in perfect condition as additional franking on postal stationery 5 Pfg. 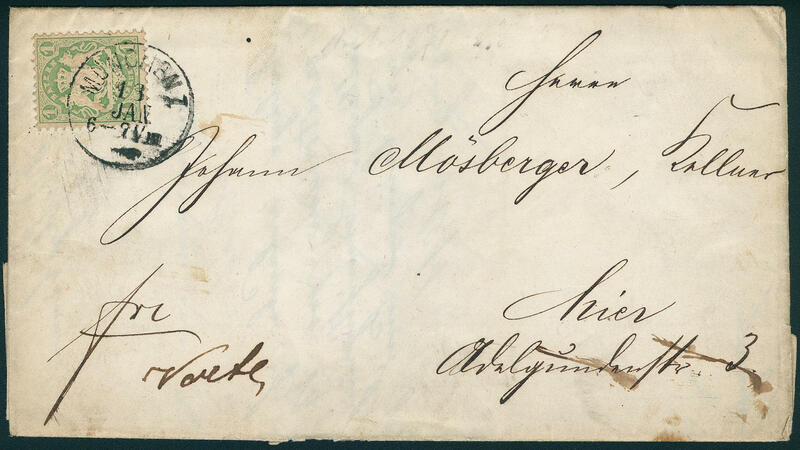 With clear single circle postmark \"LUDWIGSHAFEN 17.7.77\" to Meggen / Switzerland with arrival postmark. From this extraordinarily rarely colour are only a few documents have become known. 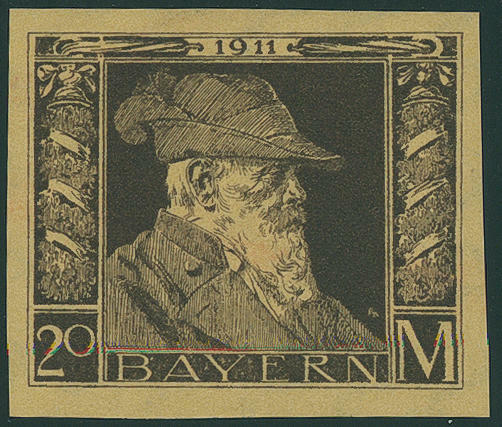 In this kind as international franking a significant rarity the Pfennig period! Photo expertize Dr. Helbig BPP. 4377 42 50 Pfg. 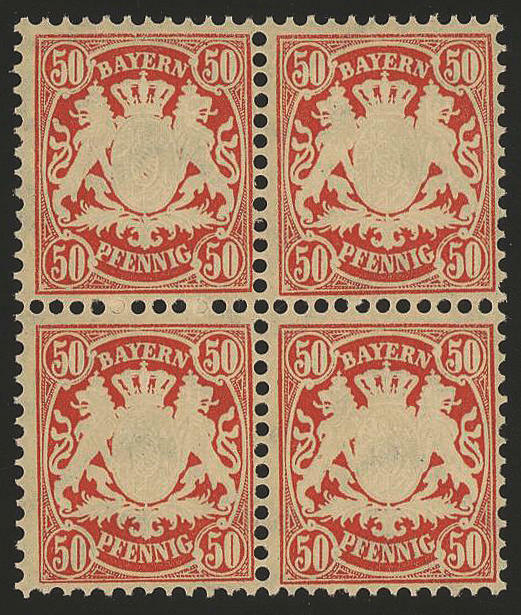 Brick red, wonderful block of four, fresh colors and in perfect condition mint never hinged, without any signs. Photo expertize \"perfect quality\" Sem BPP. 4378 42ZS 50 Pfg. Brick red, horizontal gutter pair, fresh colors and in perfect condition mint never hinged, without any signs. Photo expertize \"perfect quality\" Sem BPP. 4379 56/57ByU 10 Pfg. And 20 Pfg. 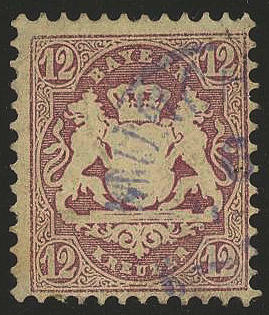 Coat of arms, four sides unperforated from lower margin, in perfect condition mint never hinged, expertized Brettl BPP. Michel 360,- €. 4380 60/63yU 3-50 Pfg. 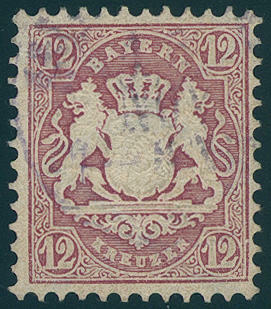 Coat of arms 1890, white paper, all fours values four sides unperforated uniform from left margin of sheet, in perfect condition mint never hinged, scarce set, expertized Brettl BPP. Michel 950,- €. 4381 65/68yU 2, 30, 40, 80 Pfg. 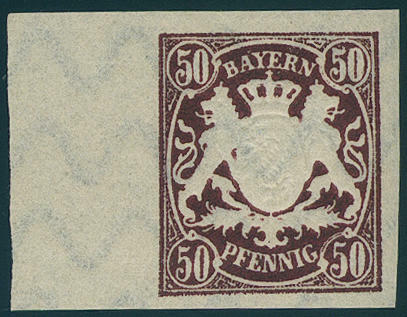 Coat of arms from 1900, white paper, four sides unperforated from margin of sheet, in perfect condition mint never hinged, expertized Brettl BPP. Michel 880,- €. 4382 65yUPl.Nr. 2 Pfg. 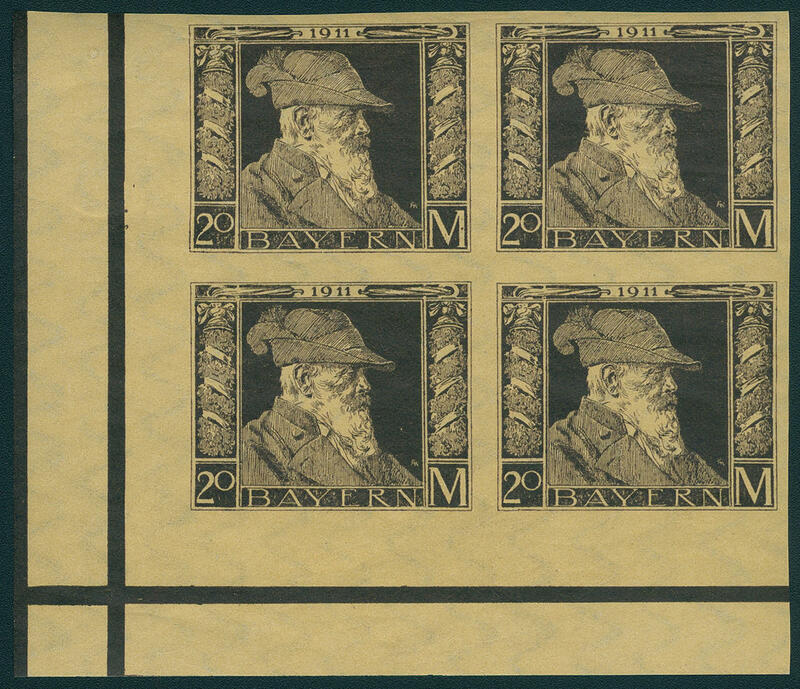 Greenish gray, white paper, four sides with wide margins unperforated from the left lower corner of the sheet with plate number 33, fresh colors and in perfect condition mint never hinged, in this kind in the Michel special catalogue unlisted, expertized Brettl BPP. 4383 91IIU 20 Mk. 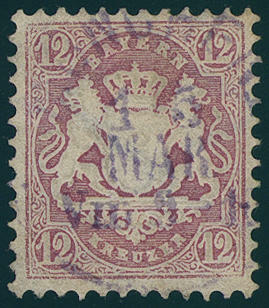 Prince regent Luitpold, the scarce type II, four sides unperforated block of four from the left lower corner of the sheet, wonderful fresh colors and in perfect condition mint never hinged, without any signs. Very decorative and scarce unit! Michel 3600,- €. 4384 91IIU 20 Mk. 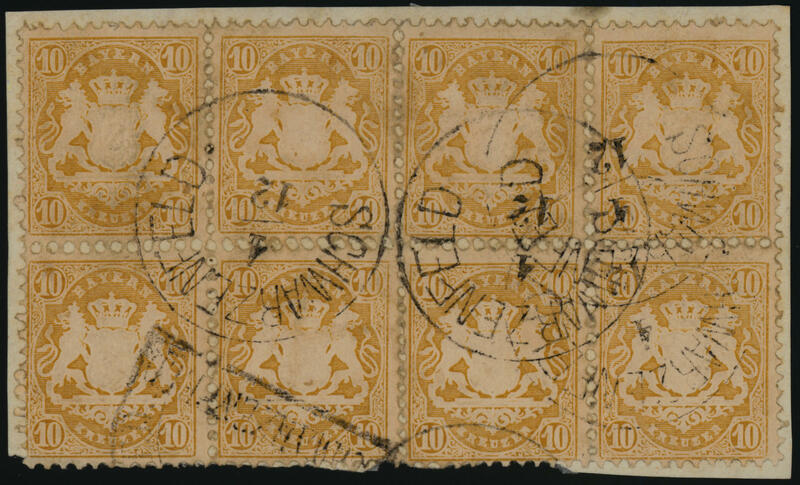 Prince regent Luitpold, scarce type II, four sides with wide margins unperforated, fresh colors and in perfect condition mint never hinged, without any signs. Michel 900,- €.